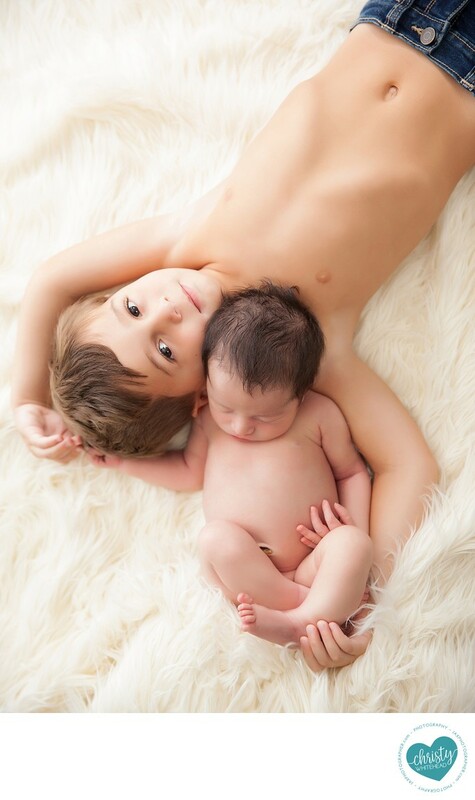 Sibling photos should be on everyone's list for must have newborn photos. When it comes to photographing your sweet new bundle, it can be easy to think of only their photos. But just as it's important to get photos with mom and dad, it's important to incorporate siblings in the session too. This is an exciting time for everyone! Just as you will want to capture those tiny newborn details, you will also want to capture the love between siblings, the excitement of a new brother or sister, and the size comparisons between your children. I'm well equipped to handle siblings in the studio, with an area set up for them to play while we finish the session. Or, some parents choose to bring the siblings in at the very beginning of the session for the family portraits and then one parent takes the children home while the other stays to finish the session. Newborn photography sessions can take anywhere from 2 to 4 hours so many parents choose the latter option. In the case of little Kip(yep just like game of thrones actor! ), his big brother did SO well and loved having his photo taken. This is just one of my favorites from the session. Both boys were total angels!